Population: According to the 2003 census, there are around 23,900 Manchu residents in Xinjiang, 0.12 percent of the region’s population. Language: The Manchu language belongs to the Manchu-Tungusic branch of the Altaic language family. Today, spoken Mandarin Chinese and Chinese characters are commonly used among the Manchus in Xinjiang. History: The ancestors of Xinjiang’s Manchus arrived in several waves of migration from northeastern China during the reign of the Manchu Qing Dynasty (1644-1911). Qing troops were stationed in places like Balikun, Hami and Turpan during the time of the Yongzheng Emperor. After the Qing army put down rebellions of Dzungarian nobles and of major and minor Hoja, the Qianlong Emperor set up garrison headquarters in Ili in 1762 to take control of the areas on both sides of Tianshan Mountains. Wherever the Qing troops were stationed, they constructed Manchu settlements. Since the government allowed soldiers to move their families to the frontiers, the Manchu population in Xinjiang saw a dramatic increase. In those days, the Manchu population concentrated in Qitai, Ili and Urumqi, among other places. Economy: The majority of Manchus in Xinjiang live on farming. Diet: Their traditional staple is wheat, although other grains are also used. Daily foods include rice-flour cakes, dumplings with various fillings, baked bread, steamed buns stuffed with mashed red beans, candied rice pastries and deep-fried dough bars. Culture: The pantheist Manchus used to venerate crows, swans and dogs, and eating or using anything from dogs is still a taboo. Holidays: The Manchus customarily celebrate Spring Festival and Mid-Autumn Festival as the Hans do, but the Banjin Festival, which falls on the 13th day of the 10th lunar month, is a specifically Manchu tradition. Banjin in the Manchu language means “birth” or “thriving.” It marks the day when the ethnic group renamed themselves “Manchu” in 1635. Religion: The Manchus used to be Shamanists. 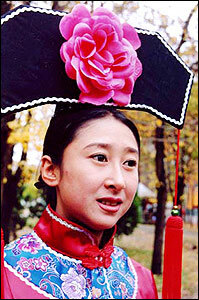 Costume: By tradition, Manchu men and women wear long robes. There are lined, unlined, cotton-padded and fur robes for each season. Nowadays, Manchu style robes with slit skirts for women and long gowns for men are still fashionable. Marriage: Monogamy is the law among the Manchus. Marrying customs are meticulous, from engagement and taking the bride to the bridegroom’s home to drinking from the wedding cup at the wedding ceremony. On the 7th day of a wedding, the groom accompanies the bride back to her mother’s home for a brief visit. The bride stays in her parental home for thirty days after the wedding, which ends only when all these stages have been completed. Residence: The Manchus traditionally live in three- or five-room houses built with wooden-frames and adobe. They tend to build their homes facing south.